Howdy! And welcome to your monthly spotlight on the Open Knowledge Foundation. There’s a whole load of stuff coming up as always, with our community becoming ever more global and ever more active – find out some of it below. It’s just 2 weeks until we’ll all hang out in Geneva, so have a good fortnight and see you very soon! Oh and here’s something fun for you: check out the new animated GIFs section on the Public Domain Review. It’s open to submissions – what can you make? Thanks to its Geneva location, the year’s biggest open knowledge event is set to be a groundbreaking moment in open government and open development. It will bring together representatives from a wide range of UN agencies, as well as government bodies, with technology activist, civic entrepreneurs and data designers – a potent mix for effecting real change. You can see a selection of our main speakers (more to come!) at a glance, and visit the OKCon website to discover more about what’s going to be happening. And if you haven’t got your tickets yet, there’s still a small number available – grab them quick! We’re super excited to see you all – check out this video from our community to get you in the mood! Governments around the world are currently pondering a key concern for global financial transparency: whether registries of beneficial company owners should be published as open data. Beneficial owners are the people who actually benefit from the operations of a company – as opposed to the sometimes irrelevant listed owners. This information is clearly of profound public interest, and its publication as open data is imperative in the fight for greater corporate accountability around the world. Over the coming months we will be working with advocates and organisations internationally to ensure governments make the right decision on this crucial issue. Join the openspending list to find out how you can help the campaign. The Open Government Partnership Annual Conference is coming to London on the 31st October and the 1st November. We’re busy preparing for it, and especially for the one day civil society event which will precede the main conference, and which we’re helping organise. If you want to be there, pre-register now for updates as they happen. The new round of Panton Fellowships have been awarded! We can’t reveal names yet, but keep your eyes on the blog for all the details of this year’s open science pioneers. We’re looking forward to seeing what they make of the legacy of last year’s fantastic Fellows. And from our Local Groups: the Irish Local Group are planning a hackathon on 28th September to work on a CKAN portal, amongst other things; in Indonesia on September 4th there’s going to be an open data meetup in Jakarta, with a special appearance from our founder Rufus Pollock; OKF Deutschland are hosting their first hack day for young people on the 7th and 8th September in Berlin; and in Argentina Friedrich Lindenberg will be joining the crew in Buenos Aires on 3rd September for an OpenSpending meetup! Phew – keep up with the international community on the global feed. There are a few updates from the very cool Open Economics project, which aims to bring openness, transparency and open access to economics. This month they completed work on the Open Economics Principles, and since the launch have already received 178 signatures as well as one institutional endorsement from the World Bank’ Data Development Group. They’ve also recently built a prototype for the storage and search of econometric results, which they’re calling Metametrik. In a world of rapidly increasing data availability, Metametrik allows researchers to find relevant sets of papers based on a whole load of variables, including dependent variable, independent variable, model, controls, journal, year, authors, JEL codes and key words. Find out more here. And as the Open Economics project comes to the end of its first phase, Velichka has shared the story so far on the blog – have a read for an inspiring example of the progress the can be made in a single domain of openness in a short space of time. What’s next? It’s been a month for big announcements on openness, and we’ve been at the forefront as ever. The G8 summit in Northern Ireland catalysed a whole load of activity around open government data, and we want to make sure that words are translated into effective action. We’re especially interested at the moment in tax avoidance and in carbon emissions data. These are two globally important areas in which greater openness and transparency could make a real difference to creating a fairer future. Of course we’re still doing tonnes of other stuff, with important activity in Open Science, Open Economics and Open GLAM reported below. And if you’d like to work at the Open Knowledge Foundation, check out this great opportunity to join us as a community manager! If you think you could support the Open Knowledge Foundation with a regular or one-off donation, that would be fantastic – check out the supporters’ page for more details. As you will undoubtedly be aware if you take even a cursory interest in Open Government Data, this month was the G8 conference in Northern Ireland, and some important announcements were made. See our discussion of the Lough Erne Open Data Charter, which makes it clear that open data is crucial for governance and growth, and we were also really excited by the support from G8 Science ministers for open data in science. It’s certainly a good time for open data in government, but we’re here to make sure that actions match words. That’s why we released a preview of the results of our Open Data Census, looking at how the G8 countries are doing. While there’s a lot of encouraging moves being made, we found that the G8 must work harder to open up essential data, and lead other world governments forward on the route to openness. While lots was said on tax avoidance and open data, for example, we are yet to see serious commitments for action in opening the relevant data to penetrate the secrecy of tax havens. Work continues on completing the rest of the Open Data Census, so if you’d like to help with this crucial community-driven effort to hold our governments to their promises, get in touch. One initiative which we hope will help ensure that the voice of civil society is heard loud and clear in the corridors of power is the Global Open Data Initiative (GODI). We’re joining forces with the Sunlight Foundation, the Open Institute, Fundar, and the World Wide Web Foundation, to share principles and resources on how best to harness the opportunities created by open government data. And the global reach of Open Knowledge has been massively augmented this month by two important linguistic developments: the launch of our global French-language community, and the launch of Escuela de Datos, the Spanish-language version of School of Data. We’re really excited to see how these pilot programmes go, and are looking forward to rolling them out in more languages. We believe that carbon emissions data needs to be put at the heart of the global open data agenda. The Lough Erne declaration made a cursory mention of “pollution levels”, but discussion of carbon emissions data was conspicuous by its absence. It was great to see open data included in President Obama’s new action plan on climate change, as part of the Climate Data Initiative. However we hope that while the emphasis was placed on using open data to prepare for climate change, the role of data in preventing climate change will also be recognised by the administration. Open data can be used to hold polluters to account, as well as improve resilience to the increase in natural disasters. 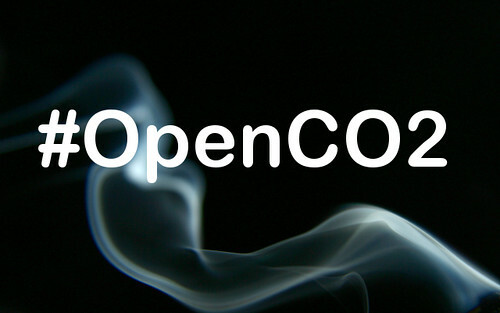 If you’d like to find out more about our efforts to open up the world’s carbon emissions data, you can follow #OpenCO2 on twitter, or sign up to the open-sustainability mailing list. The second year of the Panton Fellowships is open for applications. Following on from the fantastic work of Ross Mounce and Sophie Kershaw last year, we are looking forward to working with more inspiring scientists in openness. The Second International Open Economics Workshop took place on June 11-12 in Cambridge, MA. A wide range of super interesting speakers made the event a great success – look out for post-event details on the blog. The first OpenGLAM Advisory Board has been appointed. The seven distinguished members include Dan Cohen, the founding executive director of the Digital Public Library of America, and Jill Cousins, the Executive Director of Europeana. News from OKCon: the selected proposals have been announced! As well as the main conference days, on the 17th and 18th September, a pre-conference day on the 16th will host additional sessions and provide networking time, and the 19th September will see a whole host of satellite events taking place around the city. Get your tickets now! The Open Government Partnership Africa conference took place in Mombasa on the 29th and 30th May. Check onut this interesting piece from the blog on “Africanising the OGP”. Our friends in Ireland have also been celebrating advancements in the realm of open government, and we were pleased to hear about decisions there to work towards OGP membership. We heard this month about a couple of interesting projects to open up weather data and forecasting, OpenMeteo.org and OpenWeatherMap.org. And congratulations to the Open Contracting Partnership, who this month published their Principles for Open Contracting. Weather forecasting as we know it began in earnest in the nineteenth century, when the invention of the electric telegraph revolutionised long-distance communications and made it possible for information about incoming weather to travel faster than the weather itself. Since then weather forecasting has become ever-more accurate, with improvements in the technology of reporting and communicating, as well as in the predictive models, making it possible for us to know the future weather in greater detail than ever before. The data collected by weather stations across the world is translated by algorithms into predictions about the weather which is coming. But while some raw data is freely available to those who wish to use it, other datasets are locked behind towering paywalls, and all output predictions are generally the closed property of big forecasting companies. “Mobile apps developers can receive any weather data for their applications by using JSON / XML API. Lots of weather applications for Android and iOS use OpenWeatherMap as weather data source. By the way the data can be received from WMS server and can be embedded into any cartographic web-application. Later this week, Nicolas Baldeck from OpenMeteoData will tell us more about how he came to be interested in opening the weather, and what future he sees for the project. Sign up here to receive the monthly Open Knowledge Foundation newsletter by email. How time flies! May 20th was our 9th birthday, and to mark the occasion we allowed ourselves a little reminiscent birthday post, looking back on how we’ve been doing. Thanks so much for all your lovely messages and birthday wishes! And we couldn’t have asked for a better birthday present than this month’s exciting CKAN news (see below if you haven’t heard)! In amongst all the champagne corks, we’ve been doing a tonne of other stuff too – special mention this month to the School of Data, whose Data Expeditions are super-exciting, and to the ever-expanding network of Local and Working Groups in all their brilliance. And as ever, if you think you could support the Open Knowledge Foundation with a one-off or a regular donation, that would be fantastic – check out the supporters’ page for more details. CKAN is one of our longest-standing projects at the Open Knowledge Foundation, and this month saw two momentous developments: the release of CKAN 2.0; and the relaunch of the U.S government’s world leading data portal, data.gov, with CKAN now at its core. CKAN is an open source, open data management platform already used by data producers around the world, and these milestone are catapulting it to celebrity-status. The slick map-based searching is a favourite new feature, but there’s tonnes of other great stuff to play around with. Congratulations and thanks to everyone who has worked so hard to get us here: in the words of Jeanne Holm from data.gov, “a splendid group of folks”! Some really interesting stuff has been going on in the School of Data, whose new series of Data Expeditions both topical and timely. Data Expeditions are are team-based experiments in learning the art of data storytelling, and are open to all. In the context of the tragic garment factory collapse at Rana Plaza in Dhaka, May’s Expedition started work on mapping the data on garment factories and clothing supply chains. Keep your eyes open for the results. The next Expedition, on 6th June, is focusing on the sensitive topics of tax evasion and avoidance, and future Expeditions are planned to explore the relationship between our personal and global economic situations. Get involved! The Open Knowledge Foundation Network – our international community of local initiatives and thematic working groups – is becoming ever more active as well as more global. OKF Nepal helped run this great event to encourage girls to get into ICT, while the Open Hardware Working Group have celebrated their first birthday with the launch of the first version of Principles for Open Design. We’re really happy to welcome the first waves of Open Knowledge Ambassadors to the Network too – it’s super-exciting to see the applications pouring in from all four corners of the world! Check out this month’s updates from Working Groups and Local Groups on the blog, and maybe you’d like to figure out how you can help. We were really pleased to announce the Open Humanities Awards winners – congratulations to Dr Bernhard Haslhofer (University of Vienna) and Dr Robyn Adams (Centre for Editing Lives and Letters, University College London)! There’s been a flurry of OKCon 2013 updates, including the announcement that Ellen Miller of the Sunlight Foundation will be keynoting. Early Bird tickets are available until the 23rd June, and the results of the Call to Proposals will be announced soon! To keep up-to-date with all the news, check out the OKCon blog and Twitter. The Veni Competition, run by the LinkedUp Project, is open until the 27th June. We’re looking for you to design and build innovative and robust prototypes and demos that analyse or integrate open web data for educational purposes. 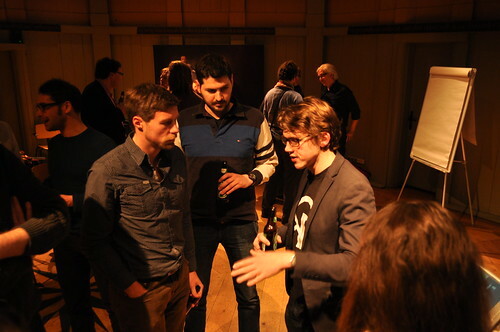 And we’ve launched another cool competition in collaboration with WIkimedia France, the Public Domain Remix, and we had a very fun time at the launch! In response to last month’s discussions on big data and small data, Joris Pekel discussed how the debate translates to the Galleries Libraries Archives and Museums sector. And on International Clinical Trials Day, Iain Hrynaszkiewicz reviewed the state of open knowledge in medicine, and renewed calls for open clinical trial data. Heard of Big Data? How about #smalldata? There’s been loads of buzz this month around #smalldata, and the need to prevent the centralisation of data-power in the hands of the few. Redistributing knowledge power is what we’re all about at the Open Knowledge Foundation, and this month’s launch of data.okfn.org is doing just that – making it easier than ever for everyone to get their hands on the data and make it used and useable. Find out more below. With OKFN:Local initiatives continuing to spring up across the globe, it seems like this vision is becoming a reality. Rhizomatic sharing of tools and skills are making it ever easier for data to be turned into the knowledge we need to build a more fair and sustainable world, from local to global. Keep up the inspiring work! With so much going on, we’ve decided to make our updates to you a bit more frequent, so we’ll be sending out a newsletter once a month. You can sign up here to have it delivered straight to your inbox. And, of course, we remain a not-for-profit organisation, providing all our community services openly and for free. We rely on the generosity of our institutional and individual supporters. Please visit okfn.org/support to find out more about how you can help. This month saw the very exciting launch of a project which has been quietly brewing for some time. 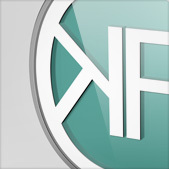 Frictionless Data – data.okfn.org – makes it radically easier to get the data you want in the form that you need it. Its about creating an infrastructure so that we’re not re-doing each others’ work, through standards and simplification. We’ve started with some key datasets, curated, quality-checked and packaged, ready for use by you. It’s currently in alpha, and we’d love you to get involved in the discussion. Check out data.okfn.org for more! OKCon 2013 will take place in Geneva on the 17th and 18th September 2013. We are very excited to announce that our Call for Proposals has gone live today! We want to hear what you want to do at OKCon 2013 – and you’ve got until May 24th to tell us. The overarching theme of OKCon 2013 is Open data – Broad, Deep, Connected, and we’ve identified six thematic areas for our talks and workshops: Open Data, Government and Governance; Open Development and Sustainability; Open Science and Research; Open Culture; Technology, Tools and Business; Evidence and Stories. Get in touch now with your ideas! Remember our very cool micro-tasking tool, Pybossa? Well we’ve been hacking away on it for a while now, and it was very exciting this month to see the launch of Crowdcrafting, the Pybossa-powered open source platform for developing and sharing projects that need the help of thousands of volunteers. Launched in collaboration with the University of Geneva, the platform has already been used for all sorts of projects from mapping the impact of a typhoon through tweets, to classifying the orientation of magnetic molecules. Get involved! It’s so exciting to see the work of Open Knowledge Foundation groups around the world. From conferences and hackathons in Spain, to a new Icelandic CKAN, find out all the news in the Global Community round up. And while our Nepalese group held it’s first public event, OKF Greece completed its eighteen-month journey to full Chapter status! The groundbreaking Panton Fellowships have come to an end. Find out what our Fellows have been doing to spread openness in the sciences over the last year. The Public Domain Review has been Saved! After a heroic community fundraising effort, the Public Domain Review surpassed its $20,000 target, and can continue to bring us all joy. The School of Data teamed up with P2PU to offer their inaugural Data Explorer Mission, this time looking at Carbon Data – like a Data Expedition but with a robot as your guide. You can still sign up with Mission Control for future Missions here. And the Open Research Data Handbook is taking shape, but we want your case studies. Rufus Pollock gave us “Forget Big Data, Small Data is the real revolution” (reprinted in the Guardian), and “What do we mean by small data?” – have a read, and then get involved in the debate on the hashtag #smalldata. Velichka Dimitrova revisted the disgraced Reinhart-Rogoff paper on austerity economics, the perfect evidence of the need for open data in economics – and was picked up by the London School of Economics and the New Scientist. Laura James explored the difference between open knowledge and open data, and explained why we seek a vibrant open knowledge commons. Katleen Janssen and Ton Ziljstra took a closer look at the new European Union Public Sector Information directive, and found some success and a number of flaws. And Jonathan Gray expressed his hopes from the newly launched Digital Public Library of America, as a driving force for public domain works and the development of the cultural commons. Sign up on the right to receive our newsletter straight into your inbox every couple of months! It’s exciting times at the Open Knowledge Foundation! We’re determinedly ignoring the never-ending winter here in Europe – Spring has definitely sprung for us, with more activity than ever across the network, creating change by educating, empowering, evangelising and making. Open Data Day 2013 really demonstrated what an exciting and inspiring bunch you all are, and we can wait to see you all at Open Knowledge Conference 2013! We’re super excited to release the first details of the event – find out below when and where this year’s biggest open data and open knowledge event will take place. The OKFN is a not-for-profit organisation – all our community services are provided openly and for free. We rely on the generosity of our institutional and individual supporters. Please visit okfn.org/support to find out more about becoming an Open Knowledge Foundation supporter. The news is out! The Open Knowledge Conference 2013 will take place in Geneva, Switzerland, on the 17th and 18th September. It’s been a hot source of speculation since we even left Helsinki last year, and we’re really excited to finally be able to share the news with the world. This year’s theme will be “Open Data: Broad, Deep, Connected”, and our call for proposals will be launched next month. In the meantime, Early Bird tickets are already on sale – make sure you don’t miss out on the world’s leading open knowledge and open data event. OKCon 2013 builds on the massive success of last year’s OKFestival, and our OKCon 2011 in Berlin. To find out more, including how you can get a free volunteer ticket, check out this blog post. We were so impressed by the results of this year’s Open Data Day, and especially pleased about all the work done building up the Open Data Census. As our global community keeps growing, it’s really inspiring to see what can be done when we all pull in the same direction. The Census is an ongoing process, so do get involved with this effort to chart and compare the openness of countries around the world! The amazing work produced on Open Data Day was in large part down to our expanding network of OKFN:Local Chapters, Initiatives and Ambassadors. It was great to see the excitement around our new Ambassadors scheme, supporting people to become local leaders in open knowledge; and you can now find out more about what some of the local groups have been up to in our monthly community round-ups. What’s so important about openness? Who are we and where have we come from? What does the future look like? 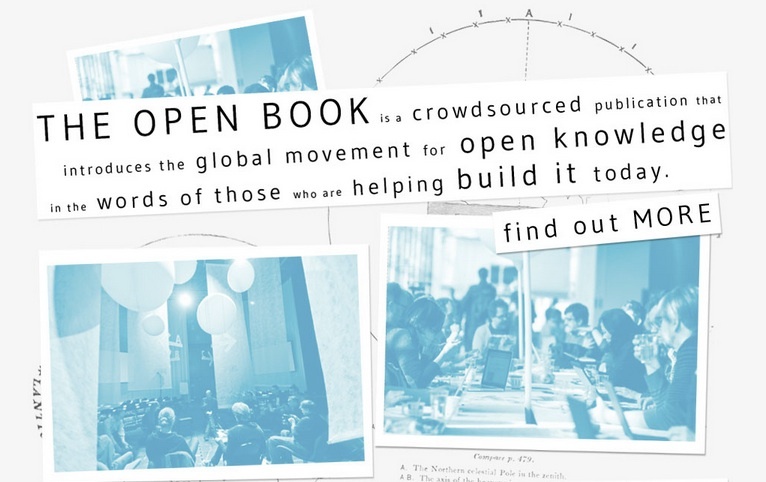 The Open Book is a collaborative endeavour between the Open Knowledge Foundation and the Finnish Institute of London, exploring the social and technological manifestations of this emergent movement for the first time. The Book was launched at Future Everything, and is now available online for free! The beautiful Public Domain Review, our showcase for the most weird and wonderful products of the public domain, needs your help to stay afloat. They need to raise $20,000 by May 1st – and if you donate $40 or more you’ll get a very great free tote bag! We’ve got two really cool projects submitted to the excellent Knight News Challenge this year. Our Open Spending team have proposed this fascinating and important project to monitor public money and mineral reserve flows in Africa, to combat cronyism and corruption. And our CKAN team would like to make amendments to the DataHub platform which will enable local governments to avoid the sometimes prohibitive costs of implementing a data publishing platform of their own. Head over to the project proposals to get all the details, offer any feedback, and applaud them if you think they’re great! Build your own FOI portal with Froide! The open-source, Python-based Freedom of Information platform which powers the German and Austrian instances of FragDenStaat, was released in version 3.0 this month. We’re running two very exciting challenges at the moment. The LinkedUp challenge – part of the Linked Up project – is about promoting the innovative use of linked and open data in an educational context, and the Open Humanities Awards is offering €15,000 worth of prizes to 3-5 projects which use open data, open content or open source to further humanities teaching and research. The deadline for the Humanities Awards is now closed – so look out for the winners soon – but you still have time to get involved with the LinkedUp challenge! It’s with great gladness that we welcome Tony Hirst into the School of Data team as a Data Storyteller! We also bid farewell this month to Kat Braybroke from our community team – have a great time Kat, see you soon! 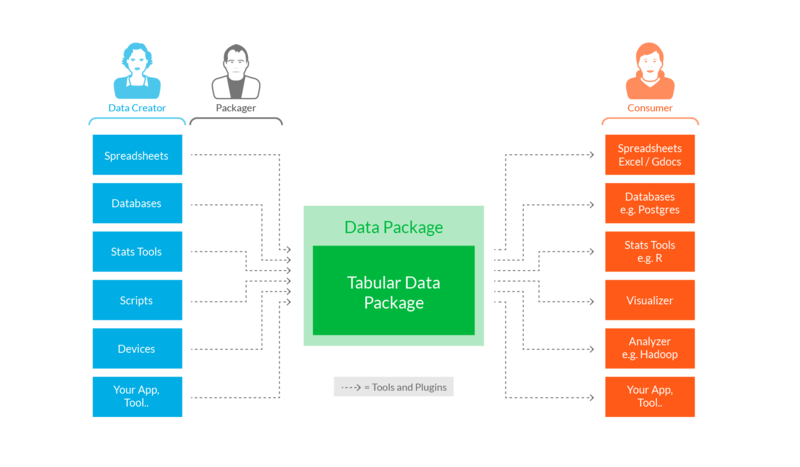 We love POD – the project to make an open database of product data. Definitely a really interesting new angle on what and who can be open. LobbyPlag and DemocracyMap are two other entrants to the Knight News Challenge that we found especially exciting, offering two different avenues for really impacting on how citizens can hold their representative to account. Parltrack, the platform for monitoring the legislative goings-on in at European level, is also continuing its excellent work shining lights into the corridors of power – we really hope they get enough cash to keep going from their crowdfunding appeal! The Open Food Facts project, which saw a lot of development at the hands of OKF France on Open Data Day, seems like something that could really take off, as a time when food is becoming an increasingly political issue. Exciting work which combines open linguistics with open literature is being done by the guys at Version Variation Visualisation. The tool looks at how translations of classic texts vary through time, providing a window into the social struggle for meanings. And Andrew Palmer, from Development Initiatives, discussed the role of openness in the formation of the post-2015 UN governance objectives, as the Millennium Development Goals come to an end. We’re really pleased by this week’s announcement from the Society of Cultural Anthropology that their influential journal, Cultural Anthropology will become open access by next year. The plan is that from the first issue of 2014, the journal will be available online globally under an open access license, along with 10 years’ worth of the back catalogue. This is a boon to our authors, whose work we can guarantee the widest possible readership —and to a new generation of readers inside of anthropology and out. Cultural Anthropology will be the first major, established, high-impact journal in anthropology to offer open access to all of its research, and we hope that our experience with open access will provide the AAA as a whole, as well as other journals in the social and human sciences, valuable guidance as we explore alternative publishing models together. As far as we can see, the specifics of licensing are yet to be figured out, as are other logistical questions like where the journal will be hosted and what it’s financial model is going to look like. Still a lot of work to be done, then, in making this a sustainable and truly open reality, but we’re really happy their taking the plunge! Look out for opportunities to discuss these transitionary issues on their website. 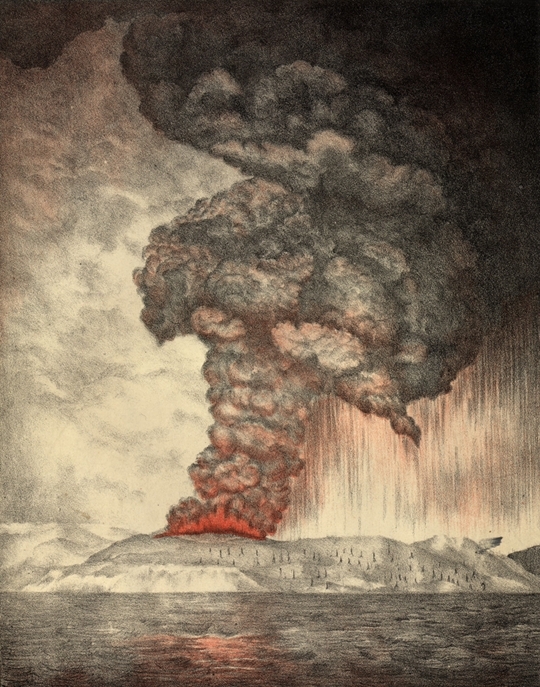 Our beautiful showcase for public domain works, The Public Domain Review, has just launched its major fundraising drive. It needs your help to stay alive. Here’s a delightful film telling the tale of our cash-strapped editor’s struggle to keep afloat – share it far and wide! 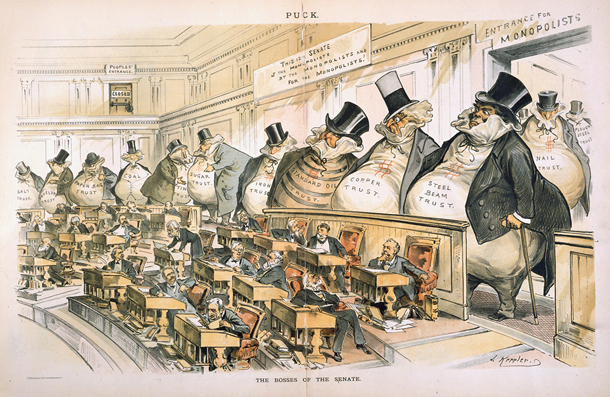 With the initial funding for The Public Domain Review now come to an end, we need your support to help us continue our mission – to promote the public domain as an indispensable public good, and to curate and showcase the most interesting out-of-copyright works on the web. 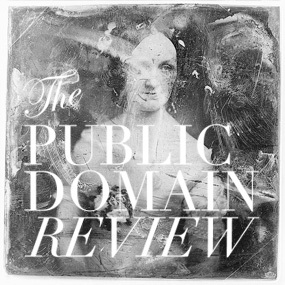 The Public Domain Review has come a long way since its humble beginnings in 2011. Over the course of our two years we’ve created a large and ever growing archive of some of the most interesting and unusual artefacts in the history of art, literature and ideas – from Gerard Manley Hopkins’s soaring meteorology of volcano sunsets, to 19th century French postcards of the year 2000; from Thomas Browne’s list of imaginary artefacts, to Napoleon’s Book of Fate. But to carry the project on into the future we need money, and so we’re turning to our community for help. With your support we can continue to tell the world about the importance of the public domain, and help to bring its most exquisite and unusual spoils to more people than ever. With a little help from 17th century astrologer, mathematician, cosmologist and occult philosopher Robert Fludd, we have designed our very first piece of Public Domain Review merchandise – a rather wonderful tote bag! The picture is from Fludd’s Utriusque Cosmi and, with its eclectic variety of disciplines depicted, it’s an image we feel represents the richness and variety of the public domain, that vast cultural commons which we are trying to open the door onto with our project. As a token of our gratitude we’ll be sending a bag free to every person who donates more than $40 (ca. €30 / £26). Food is becoming an increasingly political issue. Food security has risen up the international agenda to become one of the most talked-about aspects of strategic planning for the future. From questions of who owns the patents on the seeds people need to survive, to questions of the effects of additives in your body, to understanding the impact of our consumption habits on the environment, information about food is much-needed and often difficult to come by. The G8 is organising an International Conference on Open Data in Agriculture, to take place on the 28th and 29th April. The idea is to openly share useful, publicly funded information about agriculture across international borders, so the everyone can move towards greater food security. In particular, the G8 group have made a commitment to share this data with African countries to enable “a sustainable increase in food security”. There’s an open call for ideas to present at the conference, so if you have thoughts about how open data can improve global food security and food use then think about getting in touch. The folk from Open Food Facts are submitting their ideas, and they’ve invited input into their letter explaining why the project is important. The deadline for submissions has been extended to the 8th March, so now’s the moment! If you’d like to get involved in discussions about open data, food and sustainability more generally, sign up for our Open Sustainability Working Group. The following guest post is by Stef. European Union legislation: In whose interest? Brussels is a globally important policy-making center. of clearly attributing any changes to the interest groups pushing them. these details across departments is complex and time-consuming. Attempting to be an informed citizen from the outside is, especially if you don’t know where to look, even more complicated. internet. There are legends of a bot called Knecht written in Lisp – an arcane and powerful language – that helped the activists keep track of the Software Patent Directive at the turn of the 21st century. My project, Parltrack now enables the same for all dossiers making their way through Parliament. What can the European Parliament do? also be released remains unclear. smartphone apps can get instant updates. with digital signatures, to assure trust in the data. under a requirement to share-alike, as well as attribute, to reduce the resource-bias of large corporations. issues, and has received much praise from activists and European NGOs. are just a few exciting possibilities that are on the road map.